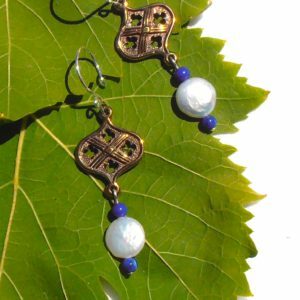 Cast Bronze and Sterling Silver Greek Diadem style Earrings. A really good risotto recipe. A smattering of German. A smattering of French. A hand drawn map of Nepal. A Phillip’s Head screwdriver. Blood red lipstick. A peasant blouse. Ballet flats. 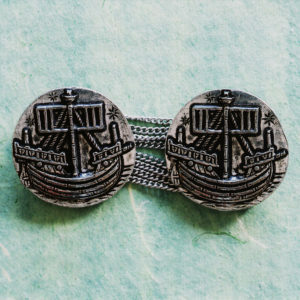 A really great pair of earrings. May we suggest these earrings? The Greek Diadem Earrings. Inspired by the rebel Greeks who so inflamed Lord Byron that he left behind the parties of Regency England to set sail for Greece -with stops along the way in Italy and other suitably romantic places. Curves and curls and perfect symmetry. 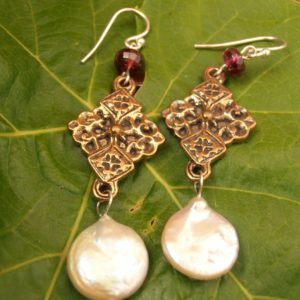 Cast bronze, cultured freshwater semi baroque “coin” pearls. Sterling silver hooks because your ears deserve nothing less.